Porsche just dropped a preview of the new 911 Turbo and Turbo S, and it looks slightly sharper, accelerates slightly quicker, and is now slightly more ridiculously expensive. Remember, this is the Turbo 911, and confusingly not those other, now-turbo 911’s. 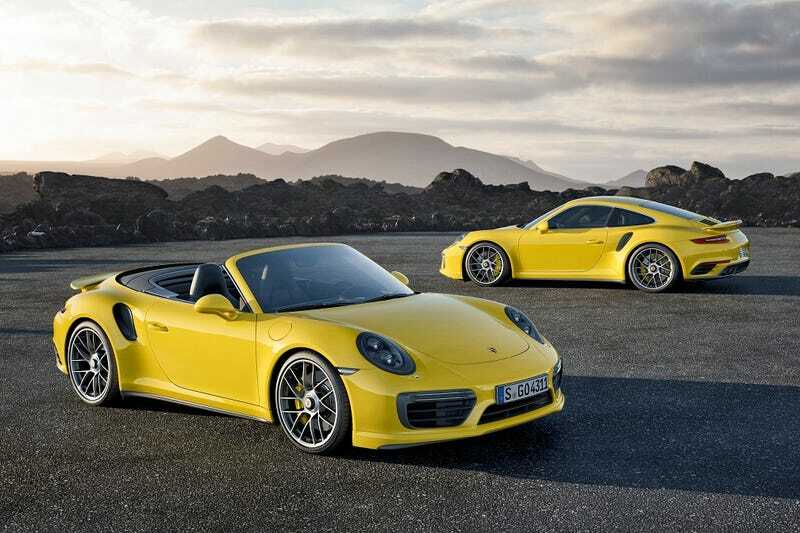 The 3.8 liter twin-turbo six-cylinder in the 2017 911 Turbo puts out 20 more horsepower than the outgoing model at 540hp, and the 2017 911 Turbo S is up to 580 hp now with larger turbos and a higher red-line of 7,200 rpm. The Turbo S can accelerate to 60mph in 2.8 seconds with a top speed of 205mph. The plain-old Turbo gets you to 60mph in 2.9 seconds and maxes out at 198mph. The Sport Chrono Package is now standard on all 911 Turbo and 911 Turbo S models, featuring the steering wheel out of the 918 supercar with the mode switch to toggle between Normal, Sport, Sport Plus, or Individual driving modes, as well as a new “Sport Response” button that preconditions the car for the best responsiveness. The car also gets the new infotainment system that’s already across the new 911 spread, with pricing starting at $159,200 for the Turbo, $171,500 for the Turbo Cabriolet, $188,100 for the Turbo S, and $200,400 for the Turbo S Cabriolet. EPA estimates will be released later, likely closer to the car’s physical reveal at the North American International Auto Show in Detroit, leaving just enough time for us to wrap our heads around those prices. Check out the full detailed release here.